It sounds like the plot of a Jane Austen novel. A young woman living in the English countryside of the early 19th century falls in love with a young man. Adults intervene to call off the relationship. She receives her only proposal of marriage seven years later, accepts it, only to reject it the following morning. She then dedicates her life to writing and composes some of the most successful novels the English language has ever known. She receives only moderate financial compensation for her work, and after her beloved father dies, she develops an unknown illness and dies of it at age 41. The only reason this isn't the plot of a Jane Austen novel is because it's the story of Jane Austen's life. Austen wrote novels, but she left behind any number of mysteries. What if her relationship at 20 had been permitted to succeed? Or what if she had kept to her acceptance of her suitor's proposal at age 27? Would she have had children? And if so, would she ever have had a room of her own and time and space in which to write? We'll never know. We'll also never know why she had no other interest in men, or perhaps why they may have had no interest in her. We do know that she wrote drafts of three of her most successful novels--Pride And Prejudice, Sense and Sensibility, and Northanger Abbey--while she was still in her 20s. Then a reversal of family fortune led to a move to Bath, on the far side of Stonehenge. While at Bath, she would remain creatively fallow, barely writing at all. And then, eight years before she died, she, her sister, and her mother moved into a moderate-sized cottage, rent-free for life, belonging to a suddenly affluent brother. 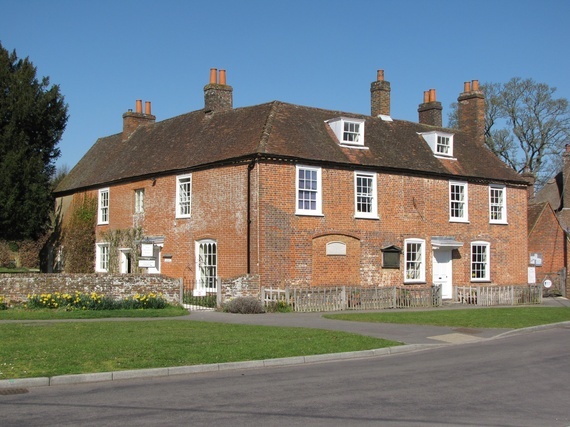 That home, in the small country village of Chawton, still stands and today attracts tens of thousands of visitors each year to what is now known as the Jane Austen's House Museum. The venue is sprucing up for the 200th anniversary of Austen's passing this July, seeking to raise a quarter of a million dollars in order to refurbish the inside, put up historically appropriate, elegant wallpaper, and generally give the house a bit of a facelift. If you visit the Jane Austen House, you'll see the actual writing table where she created her manuscripts that easily ran 600 pages or more. 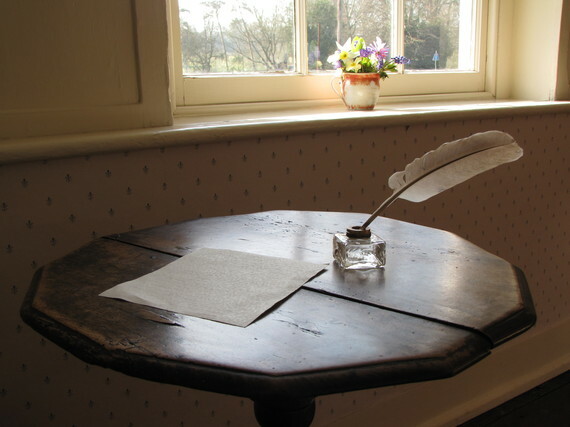 It's a small, practically non-descript round table, one that might not attract attention at a garage sale--but it's the very place where Austen wrote all of her novels. The largish cottage or smallish house, as you may see it, is warm and inviting, showing visitors what rural life was like 200 years ago. Austen fans delight in the period furniture, family memorabilia, and even a replica of the bed in which her sister Cassandra slept. Especially dutiful fans can make a pilgrimage to an august country house, then owned by one of Austen's brothers, where elegant balls would take place. In 2017, the Jane Austen House will offer a rotating exhibition of 41 objects, manuscripts, and pieces of furniture normally not on display, related to Austen's life. Each of the pieces will rotate weekly. A January visit to the Jane Austen House found the place undergoing the first of renovations due in time for the main tourist season this spring and summer--painting, repairing brickwork, renovating the well, and otherwise beginning to restore the home to its early 19th century splendor. At her passing, her estate was valued at 800 pounds, worth only about $40,000 today. It's hard to imagine a superstar author of the 21st century living that simply and leaving behind such a relatively small amount of money. Did her publisher take advantage of her? Did her books only sell moderately well prior to her rediscovery in the 1870s? Or is there some other explanation? Jane Austen is known, of course, for her novels, but the mysteries surrounding her own life and passing are equally compelling. For clues, make your way to Chawton, and decide for yourself.